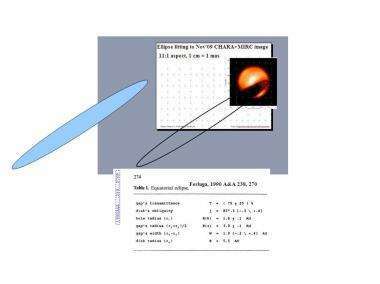 (PhysOrg.com) -- For the first time, a team of astronomers has imaged the eclipse of the star Epsilon Aurigae by its mysterious, less luminous companion star. Very high-resolution images, never before possible, have been published online today in the journal Nature Letters. 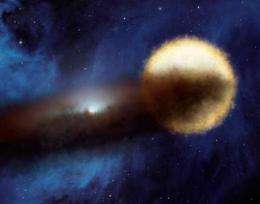 Epsilon Aurigae has been known since 1821 as an eclipsing double star system, but astronomers have struggled for many decades trying to decipher the clues to what was causing these eclipses, which happen every 27 years. The new image largely settles the matter: the eclipse is caused by a disk of material, probably similar to the state of our solar system 4.5 billion years ago as the planets began to form around our own infant sun. Seeing this eclipse in detail has only now become possible. Kloppenberg's research advisor, University of Denver Professor Robert Stencel, describes this long-awaited discovery, "Having studied this star on and off since my postdoctoral days in the 1980s during its last eclipse, it is very satisfying to finally resolve some of the long-standing questions associated with this famous star." "To capture the detail on Epsilon Aurigae, we've made use of the biggest optical telescope on earth, the 330-meter (1,083 feet) diameter CHARA Array atop Mount Wilson, California," said Kloppenborg. To comprehend its size, note that 100 meters (328 feet) is roughly the length of a football field. ok..no dragons in this one..but did you read the whole thing?